Picea abies 'Red Man' is a semi-weeping, upright selection of Norway spruce with graceful, symmetrical, swooping branches and brilliant red flush of growth in the spring. The new growth is deep, almost a burgundy-red. It stays this color for about a week then fades to burgundy, purple, gray-green then green over a period of 1-2 weeks. 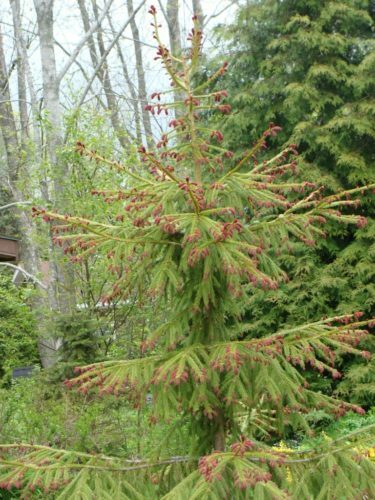 It is a very symmetrical upright tree with typical Picea abies growth rate of 2 to 3 feet (60-100 cm) per year. It is very graceful in any location but needs lots of room. It is very similar to Picea abies 'Rubra Spicata' but many believe it may be a different shade of red and possibly a more upright form. This cultivar originated in Scandinavia in a seed lot. It was one of possibly several that came to Canada with a group of touring foresters in the 1970s. It is presumed that only one tree now survives and has been in production in New Brunswick, Canada for several years. It is established at Kingsbrae Gardens in St. Andrews, New Brunswick, Canada as well as in several private gardens in New Brunswick, Nova Scotia and New Hampshire. William C. Journeay is credited introducing this cultivar to the nursery trade in 2004. He registered it through the ACS Conifer Registration program in 2011 and was later accepted by the International Conifer Registry at the Royal Horticultural Society. Picea abies 'Red Man' -- the original specimen in a private garden in New Brunswick, Canada. 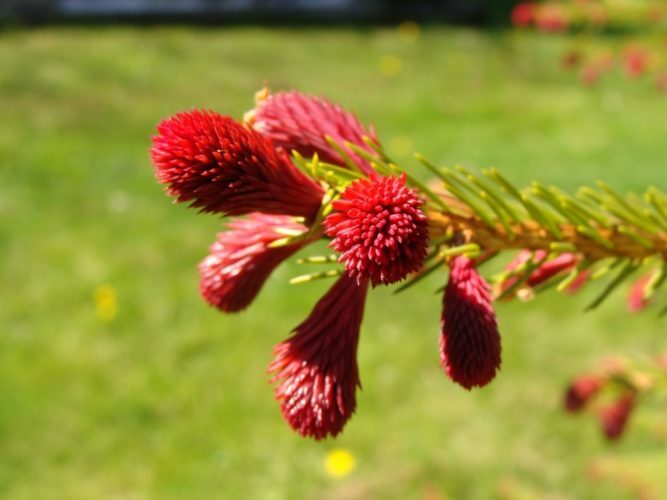 Picea abies 'Red Man' -- the brilliant flush of bright red new growth in spring.